I use herbal remedies for many things on a daily basis. From homemade lotions, to infused oils and salves, to herbal teas and veggie smoothies, we use a lot of different herbs each day for the nutritional benefits and one of my favorites is alfalfa. Alfalfa, you ask? Isn’t that what they feed cows, horses, and other livestock? Yes, it does have a long history of use in feed for livestock, in large part due to its high protein and complete nutritional profile. There are more tender parts of young alfalfa plants that are edible and beneficial for people, too, and it is more commonly used for human consumption in Europe than in the US. Alfalfa is particularly helpful for some pregnancy-related symptoms, so it’s one all moms should get to know. To some of you, alfalfa may bring thoughts of a type of hay or a character from the Little Rascals, but I’d like to introduce you to the real deal. A powerhouse among herbs, alfalfa means “Father of All Foods” and deserves its name! Sometimes also called lucerne, buffalo herb, or Medicago sativa, alfalfa is a member of the pea family. It has a long history of use in Traditional Chinese Medicine and Indian Ayurvedic medicines for digestive complaints, jaundice, and blood clotting disorders. There is also evidence that some 19th-century physicians used alfalfa for the same purposes and also to encourage lactation in nursing mothers. It’s special claim to fame is not only high level of nutrients but also how easily the body can absorb and assimilate them. Alfalfa is generally considered safe for children, adults, and pregnant and nursing mothers for nutritional support. Alfalfa contains a wide variety of minerals including iron, calcium, magnesium, phosphorus, sulfur, chlorine, sodium, potassium, silicon, and trace elements. It is also a good source of vitamin E, vitamin C, and vitamin K, which is necessary for blood clotting. It also contains essential amino acids that are not made by the body but must be obtained from food sources. Because it is so easy to assimilate, many greens powders and vitamins use it as a base. Also, it contains the highest chlorophyll content of any plant and is often used to make liquid chlorophyll, which is highly nutritious. Medicinally, alfalfa is even used in alternative medicine to reduce cholesterol and blood pressure. Its high concentration of alkaloids make it useful in reducing blood sugar levels and it is also commonly used as a blood detoxifier and for any types of arthritis or joint problems. While not all of these benefits are supported by medical studies (yet), they are worth mentioning because of alfalfa’s long history of successful, safe use. The University of Michiganasserts that there are no known contraindications to date, with the exception of consuming very large amounts. The dosage generally considered safe is 500-1,000 mg of the dried leaf per day or 1-2 ml of tincture three times daily. 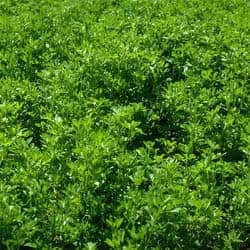 One caution about alfalfa is not to use in combination with blood thinning agents or medications as it is so effective it can interfere or amplify the effects of these. In our family, we primarily use dried alfalfa in herbal teas and tinctures. I buy it in bulk here, or check your local health food store. Just make sure to buy from an organic source as otherwise it’s likely to be treated with pesticides in conventional crops. Consuming fresh alfalfa sprouts either lightly steamed or in a salad is another option. Since consuming sprouts comes with many benefits but also a few cautions, I vary these with other types of sprouts and don’t consume them all of the time. I make an herbal tea for the kids by using equal parts alfalfa, red raspberry leaf, and peppermint as a source of vitamins and minerals that they love to drink. To brew, I just pour 8 ounces of boiling water over 1 tablespoon of the tea mixture and let steep for at least 5 minutes before drinking. As I mentioned, alfalfa is especially supportive during breastfeeding. Here’s how to use it in a homemade herbal nursing tea blend. Another more concentrated option that’s quick to administer is this homemade multivitamin tincture that’s safe for kids or adults. This process is similar to making tea but much stronger since it steeps for 3 weeks or more. A tincture like this keeps for months and a small dropperful is all that’s needed to get the benefits. We also drink a lot of liquid chlorophyll, which is a concentrated liquid of the chlorophyllins from the fresh alfalfa plant. We love this brand because it has a minty taste. (Even the kids love to drink it.) When the kids are sick, this is often all I can get them to take, and its purifying and detoxifying properties help them recover more quickly. Since it is so high in nutrients, I also don’t worry if they don’t eat as much while they are sick. Due to its mild flavor, I also add scoops of dried alfalfa to green smoothies and drinks. There’s a reason cultures have been using alfalfa for centuries. It’s one of the foundations of our food chain and a vital source of vitamins and chlorophyll. Adding it into the diet in the ways described above can improve health and energy with few side effects or risks. Give it a try!